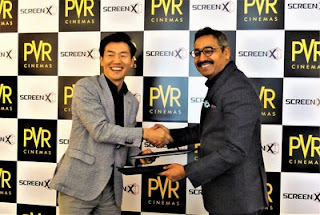 PVR Cinemas, the largest and the premium film Exhibitors in India and CJ 4DPLEX, the world's leading cinema technology company; has just signed a new deal at CinemaCon 2019 to open 10 ScreenX theatres in India by 2021. Screen X is the world's first multi-projection immersive cinematic platform which provides the moviegoers a 270 degrees viewing experience by expanding the scene onto the side walls. ScreenX allows the audience to go beyond the frame of the traditional movie screen, utilizing a proprietary system to expand select scenes of feature films and pre-show advertising to the left and right walls. It combines multi-projection technology with theatre screen and project images on the outside wall of the front screen to create a new immersion experience for the audience. Ten PVR Cinema theatres across metros; Delhi-NCR, Mumbai, Pune, Bangalore, and Hyderabad will be integrated with the industry first ScreenX technology and will set an industry benchmark for an enhanced movie viewing experience. PVR offers an array of in-cinema formats like the luxury sub-brands: Gold Class Cinemas, PVR ICON, Director's Cut, PVR Superplex and best in class technology formats like PVR Onyx -- LED screen cinemas, P[XL] -- large screens, IMAX®, 4DX, ECX (Enhanced Cinema Experience), and the recent addition of D-BOX and ScreenX.